An arena full of inflatables for the whole school to enjoy, teams normally take part in houses and compete promoting psychical activities, motivating pupils and working as a team to score points throughout the day. This is an all singing and dancing show and will keep all pupils on their toes all day. We cater for toddlers, infants, juniors right through to acaedmy secondary schools. Pictures below are secondary schools and colleges. Dave John B's It's a Knockout Roadshow is a great alternative to a school sports day ideal for school events, including School Sports Days, School Fete Days, Leaving Parties and Fundraisers. We operate throughout the U.K.
We have been providing schools with quality entertainment in a safe controlled arena for over thirty-six years with no accidents or incidents. We are unique in our shows and performances. No other show in the world comes close to our presentation style. 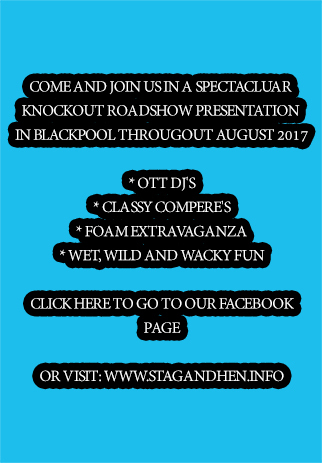 We are the first company to introduce this fast entertaining roadshow. The show can performed be indoor or outdoor. Contestants are taken round the course in groups of six teams of ten contestants, this way there is very limited waiting times between the games, it keeps everyone busy. After certain inflatables contestants are invited back to stage for fun and cabaret entertainment spots where bonus points are awarded. Testimonials are available on request. The hire fee covers the whole day. We supply all the equipment and crew as we are fully self-contained. We can cater for the whole school in one big show. Alternatively if there are different events taking place throughout the day we can split up the pupils into smaller groups and perform up to four shows at different intervals. We will fit the whole show into your school times. Staff shows are available on request. During the winter months we can supply an indoor setup for the games in your school hall, which promotes a fun-filled enviroment away from possibly bad weather situations and suited to younger children in a safe controlled area. We supply a fun childrens disco complete with inflatables, mascots and characters. This show can cater for the whole school. We have different ways of running the show, but from the past thirty-five years of experience we have found that it is more ideal to seperate the different age groups at different times. The inflatables we supply are a lot smaller to fit into the halls. This show is not run on a It's a Knockout basis. It is a fun day for the children at their own pace.